U.S. stocks advanced on Friday after technology titans, particularly the giants of internet retail and search, announced stellar earnings that powered the NASDAQ Composite and S&P 500 to finish at record new highs, with the NASDAQ 100 (+2.91%) having its single-best day since March 2009. The earnings reaffirmed leadership in the technology sector after recent declines and lackluster performance, as well as calming valuation concerns in the broader market. Investor sentiment got a lift after the Commerce Department reported the economy expanded at a 3% annualized pace in the third quarter, topping economists’ projections for 2.6%. Together with the 3.1% GDP growth during the second quarter, it is the strongest two-quarter expansion since 2014. Yet inflation remains stubbornly low, with the Fed’s preferred measure of core prices up just 1.3%, still well below their 2% target. Meanwhile, Congressional Republicans successfully charted a pathway toward passing tax cuts by the end of the year. For the week, the S&P 500 rose +0.23%, the Dow Industrials gained +0.45% and the MSCI EAFE (developed international) fell -0.34%. 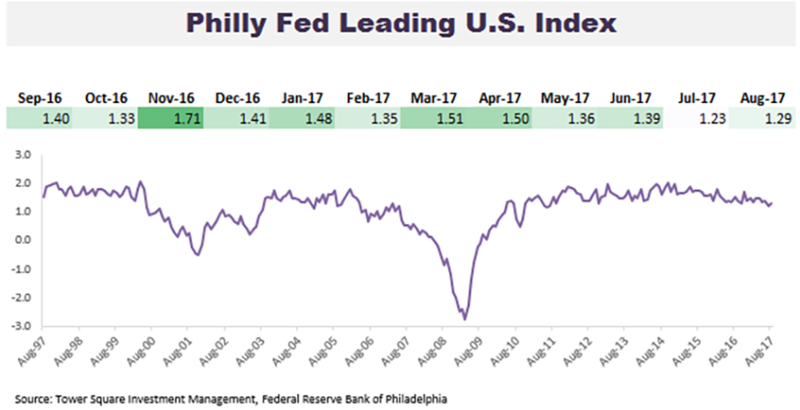 The Philadelphia Fed’s Leading Index is a composite reading of several U.S. economic indicators that lead the economy, including housing permits, initial unemployment insurance claims, and Treasury yield spreads. This index is often used as a proxy to gauge where the economy is heading over the next several months, because it measures the strength of leading indicators. As the chart above illustrates, the Leading Index historically has declined into negative territory during recessions and rises back into positive territory during expansions. The most recent reading for the Philly Fed Leading Index was 1.29, well above levels that have historically signaled a recession and only slightly below its 12-month average of 1.41, signaling continued stable growth in the months ahead.